Are you ready for this?? It's time for some multiplication (and division) madness! 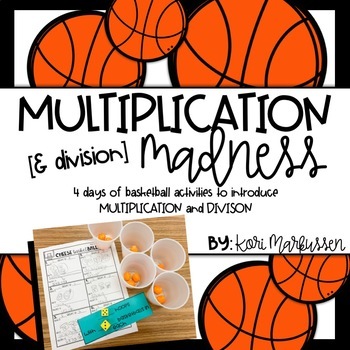 This is sure to be a slam dunk of a way to introduce multiplication and division to your class! In this pack you will receive four days worth of activities: 2 multiplication and 2 division. Students will start by practicing repeated addition and move into describing multiplication scenarios. They will then move into separating and lastly describing division scenarios by using arrays. Each day you will receive two activities, a whole group and an independent. The whole group consists of 6-7 slides each day. These can be projected on a board or used on iPads. After introducing the concept students will move into a hands on independent each day with a recording sheet. Day 2: Describing multiplication with basketballs. Students will be modeling multiplication stories and will have to describe the number of groups and the number in each group. For the independent students will be using cheese balls and cups to model their problems. Day 3: Separating into equal groups. Students will be taking players and separating them into teams. Day 4 Describing division. Students will be looking at a concession stand and will be describing what they see. The items are arranged in an array. and they will decide how many rows or columns, and then how many are in that group. For the independent they will be doing the same thing but will be using play dough basketballs to model the arrays.